Less than 15 minutes from Blue Ridge, GA, Alone at Last is the perfect retreat for relaxing after a day packed with mountain fun. Adorable cabin featuring 2 bedrooms, 1 bathroom, a charming wood stove and a sparkling hot tub! Alone at Last is the perfect retreat for relaxing after a day packed with mountain fun. The cast iron wood-burning stove heats the cabin nicely, and provides the perfect cozy mountain ambiance as you relax and reconnect. This cabin is fully equipped with WiFi for your internet needs. The steamy hot tub outside invites you to slide in and soothe those tired muscles after a long day of adventure. S'mores' on the outdoor fire-pit is the perfect ending to a fun filled day. Cabin has parking for two vehicles - One in the driveway and the other one parallel behind the other car. Visit downtown Blue Ridge, GA for a fun day of antiquing or a ride on the historic Blue Ridge Scenic Railway. Take a day trip to one of the many waterfalls or the swinging bridge. Hike one of the famous hiking trails of North GA or zip-line through the trees. The outdoor adventures await! Bring the family and your fur baby and come on up! PAVED DRIVE - Parking for two vehicles - One in the driveway and the other one parallel behind the other car. 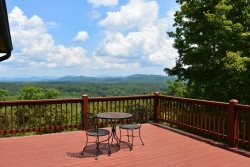 We have used Mountain Laurel Cabin Rentals for years now. Its always a great experience! We just stayed in Alone At Last. The updated shower and the fire pit were awesome! Its nice to be in Blue Ridge. Its just a hour and a half drive from where we live but it feels millions of miles away. Thank you to the owners of the company and the owners of the cabins that allow us to find a little bit of peace in this crazy world. We will be booking another trip in the summer! My fiance enjoyed our stay. It was so peaceful and relaxing. It was just what we needed. We will most likely be back!! A very cute cabin with nice touches! My husband and I loved it here, everything we needed and more. The cabin is so cozy and clean. Thank you for providing your cabin for us to stay!! Thank you for providing us with the most perfect cabin! It made our 3 years something special! We loved everything about this place and will definitely be back! My family had a great time. We love the furniture! We also love the hot tub and it's features. The beds are so comfy! Our dogs had a great time too! Thank you for providing a wonderful cabin for my family to enjoy. It was very relaxing and just the perfect size for us. We were pleasantly surprised with all the kitchen items that were provided. We look forward to staying here again! This cabin is wonderful! It was everything we wished for. We had a wonderful Christmas here. Had a wonderful time up here for our honeymoon. It was so peaceful and quiet. Much needed for the both of us. Thank you so much for letting us stay here! We'll be back soon! This cabin is very quaint and well stocked. We really enjoyed the wood burning stove and being able to relax in the nature setting. The location is a great place for walking dogs and neighbors are very friendly. We hope to return to this area real soon. Thanks for sharing your cabin with us. Love the coziness of your cabin. From sipping coffee in the morning hearing the creek afar to hearing the leaves falling. So much peace and tranquility. Alone At Last has everything needed for a nice relaxing, comfortable stay. Can't wwait to come back again!